As 2013 gets underway, we think about the things we want to do in our lives that will make a positive impact on our family and ourselves. One of the ways we can do this is to make music a part of our family’s daily life. We are all born with the aptitude for making music, just as we are born with the aptitude for learning to talk. However, if we are not in an environment that encourages and supports language development, our children will not be stimulated to speak. The same can be applied to developing our music skills. In order for our children to develop musically, they need to be in a musically rich environment on a regular basis. The most important time for learning is between the ages of 0-5 when children process information rapidly, efficiently and joyfully. They are absorbing everything in their environment and they absorb everything that their primary caregivers are doing (Mommy, Daddy, Grandparents, Nannies, and Teachers). They want to be just like the important grownups in their life. If we as the adults, are modeling that music making is fun, and if we are making it a part of daily life, just like talking and walking, then we are helping to give our children the disposition to want to make music too! The most important thing we can do to help our children develop musically is to model that music making is fun and that it is something that we love to do on a daily basis, for the joy of it! 1.) Sing hello and goodnight to all the things in your child’s room and around your house when your child wakes up in the morning and when she goes to bed. 2.) Turn on your favorite music and move around the room (hold your child if she is small enough) and exaggerate your movements – walking, marching, stomping, waltzing and tippy-toe-ing. Your strong, purposeful movements will give your child a clear model for how to move to the beat with her feet. 3.) Play many different styles of music (contemporary, jazz, classical, folk) and invite your child to talk about how the different styles of music make her feel, and what type of movement does it inspire her to make. Use items to move with, such as a scarf, and ask your child how each prop makes her want to move. Most importantly, model moving to the different styles of music yourself, then your child will be inspired to move, too. 4.) Have a “Jam Session”. 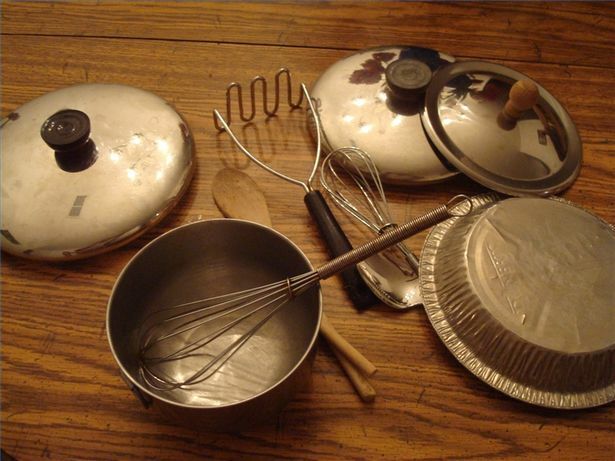 Pull out all of your pots and pans, plastic containers and wooden utensils and enjoy playing along with these “instruments” to your favorite music. Making music together is a stress reducer and can be a great way to connect with each other at the end of a busy day. 5.) Play your favorite music when you are driving in the car and sing along! This will help EASE the trip and create musical memories for you both, especially on a long road trip during a family vacation. 6.) Say, “I love to hear you singing” or “I love to hear you playing the drums/shaker/guitar” instead of saying “You sound great.” When you do this, you will be giving your child unconditional musical love, that honors their “process” of singing/playing/moving instead of the “result” of how they sound or how they are playing/moving. 7.) Make a fun musical instrument to enjoy during a “jam session”, or make a few and have your child give them as birthday/holiday gifts to friends or family members. 8.) When singing, explore the song mixing fast with slow, high with low, and loud with soft. When we put these opposite sounds and experiences right next to each other, it helps your child better understand the difference between the two. Children learn what is by what isn’t. They have to have the contrast to learn. When using a high voice and a low voice to sing, this also helps your child explore her vocal range and practice using her high voice. As a culture, we tend to speak in a low tone voice, so it is good to practice using and maintaining your high voice! 9.) Make up songs to ease your daily transitions that you go through with your child, such as cleaning up, leaving a play date or the park, and the bed and bath routine. This will help both you and your child feel calm and have fun, too.